What is Sever's Disease and How to Treat it? Let me first start by saying that this is not a disease. Let me explain. As children become involved in sports at younger ages and compete at higher levels and as expectations of the participants, parents, and coaches increase, incidence of overuse syndromes increases in growing athletes. When Sever disease occurs, the pain that the child experiences not only can limit performance and participation but also, if left untreated, can significantly limit even simple activities of daily life. This raises concern in all persons involved. Although no well-recognized, long-term sequelae of untreated Sever disease exist, the physician's role is to minimize pain and allow the child to return to normal activities as soon as possible to enhance psychosocial development. 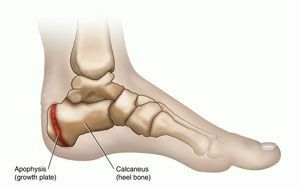 The physician also must be able to differentiate Sever disease from other causes of heel pain in the child that are potentially more serious, such as tumor or osteomyelitis. Treatment is initially focused on reducing the present pain and limitations and then on preventing recurrence. Limitation of activity (especially running and jumping) usually is necessary. In recent studies children were able to resume normal activity after 2 months. If the symptoms are not severe enough to warrant limiting sports activities or if the patient and parents are unwilling to miss a critical portion of the sport season, wearing a half-inch inner-shoe heel lift (at all times during ambulation), a monitored stretching program, pre-sport and post-sport icing, and use of anti-inflammatory agents normally reduce the symptoms and allow continued participation. If symptoms worsen, activity modification must be included. For severe cases, short-term (2-3 weeks) cast treatment in mild equines can be used. To prevent recurrence, patients, parents, coaches, and trainers should be instructed regarding a good pre-exercise stretching program for the child. Early in the season, encouragement should be given for a preseason conditioning and stretching program. Coaches and trainers should be educated about recognition of the clinical symptoms so they are able to initiate early protective measures and seek medical referral when necessary. Limitation of activity (especially running and jumping) usually is necessary. Failure to instruct players, parents, coaches and trainers regarding limitation of activity and proper pre-exercise and post-exercise stretching can lead to prolonged symptoms and further limitation of performance. ?What is this pain in my big toe?